Chapter Two of my e-book Every Bead Has a Story is finished and available!! I am really excited about it, and I hope you'll enjoy it too. 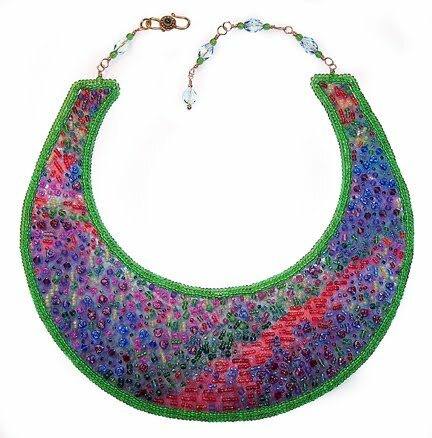 While Chapter One, Bead Embroidery Stitches, covers the basics (tools, materials, stitches, and a beginner project), Chapter Two, Altered Surfaces, begins the exploration of the exchange between mixed media and bead embroidery! SEVENTY-TWO pages long! Whew! I've priced it at $3, which I hope you will think is a total bargain. Chapter One will continue to be available as a free download forever. 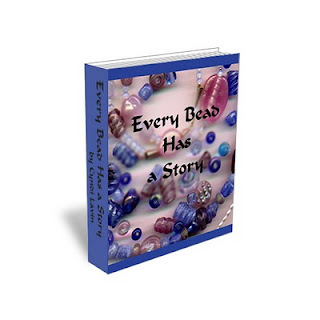 Chapter Two, Altered Surfaces, focuses on many of the different ways you can alter the surface of fabrics that you want to use for your bead embroidery, allowing the fabrics themselves to become a part of your design story. No longer will you need to limit yourself to just ultra-suede, buckram, or heavyweight interfacing! Here you'll learn how to use different fabrics and add texture, images, and lots of color...all with step-by-step instructions, of course. I've also covered several more stitches that I know you'll find helpful, including an alternative edging technique, an easy way to bezel cabochons, and a bead weaving technique adapted for embroidery. Oh, and you'll also find instructions for making the perfect wrapped loop...such an important element for finishing off your work when you want to make a bead embroidered necklace. The chapter wouldn't be complete without a couple of projects, designed to help you take these altered arts techniques and immediately begin to apply them to your bead embroidery. I sincerely hope that this chapter will inspire you to tell lots more stories with your work, and I hope that you'll consider sharing your work with me here at Beading Arts! Instructions for the fabric are included! 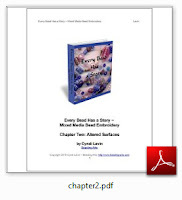 I just purchased your ebook! going to read it now! I looked up the first chapter and it is really good. Will definitely buy the second chapter when I get a chance to bead. Good luck!